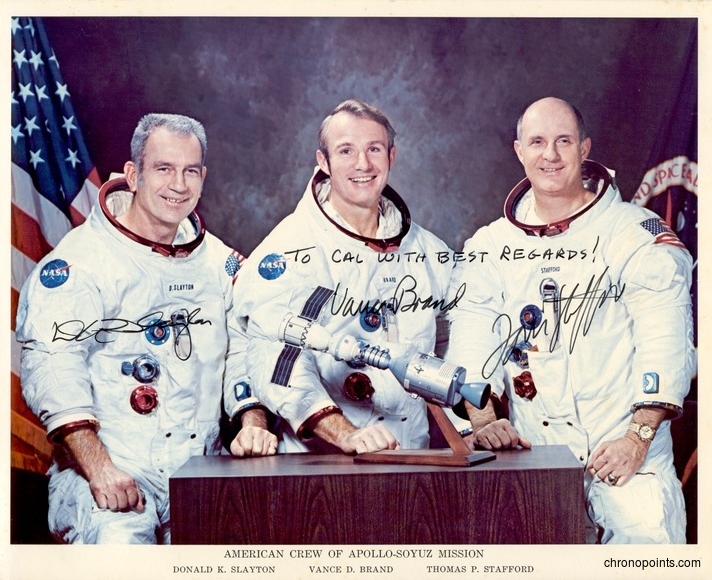 The American crew of the Apollo-Soyuz Test Project (ASTP) was composed of, from left to right, Astronaut Deke Slayton (1924-1993), first-time Astronaut Vance DeVoe Brand as Command Module Pilot, and veteran Astronaut Thomas "Tom" Patten Stafford as Commander. Brand was the only member of the original Mercury 7 never to fly previously. Slayton had been grounded because of an irregular heart beat since Project Mercury and was National Aeronautics and Space Administration (NASA) Director of Flight Crew Operations, but was given clearance for this flight. These three astronauts became the first crew to dock with another nation's spacecraft, the the Union of Soviet Socialist Republics' (USSR) Soyuz 19, thus establishing a precedent for international cooperation in space. This image was autographed for Dr. Cal Fowler (1929-2013), who had pressed the button to ignite the engines of three Mercury-Atlas missions. "Biographical Data: DEKE SLAYTON (MR.)." Lyndon B. Johnson Space Center, National Aeronautics and Space Administration. http://www.jsc.nasa.gov/Bios/htmlbios/slayton.html. 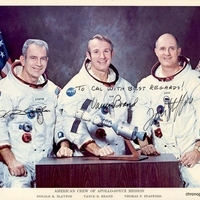 “American Crew of Apollo-Soyuz Mission.” RICHES of Central Florida accessed April 23, 2019, https://richesmi.cah.ucf.edu/omeka/items/show/6376.